Read more about Reno-Tahoe. 2018. Retailers, does your store sell custom shop/team clothing? No, but we used to. Read more about Retailers, does your store sell custom shop/team clothing? Will your store be showing the Tour de France live? Read more about Will your store be showing the Tour de France live? Retailers, do you see more or less competition from brick-and-mortar stores in your market? Read more about Retailers, do you see more or less competition from brick-and-mortar stores in your market? Retailers, do you send out suspension or hydraulic brakes to be serviced? Read more about Retailers, do you send out suspension or hydraulic brakes to be serviced? Retailers, is your shop marking National Doughnut Day? We wouldn't let such things pass our lips. Read more about Retailers, is your shop marking National Doughnut Day? Retailers, will your store be open on Monday, Memorial Day? Read more about Retailers, will your store be open on Monday, Memorial Day? 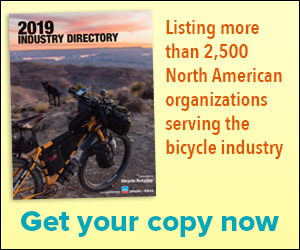 Retailers, are you marking National Bike Month with promotions? Read more about Retailers, are you marking National Bike Month with promotions? Retailers, do you charge a flat fee for service as PBMA's president suggests? Read more about Retailers, do you charge a flat fee for service as PBMA's president suggests? Retailers, does your shop do custom bike and wheel builds? Read more about Retailers, does your shop do custom bike and wheel builds?